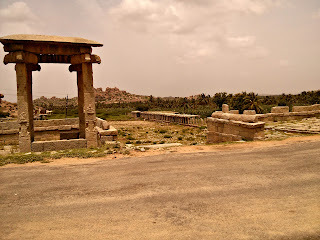 People would recommend that you at least spend a week when you visit Hampi. If not a week three days are in order to see the city which probably has more monuments than you can count on your fingers. We all know how much time we can squeeze out of office and not many people would like to accompany you to visit heritage sites. If we had three days we'd better head to beach right? The good news is you can visit the city in one day and not loose out on its heritage and charm. With all our heritage visits crammed into two day weekends in a month we didn't have much time. 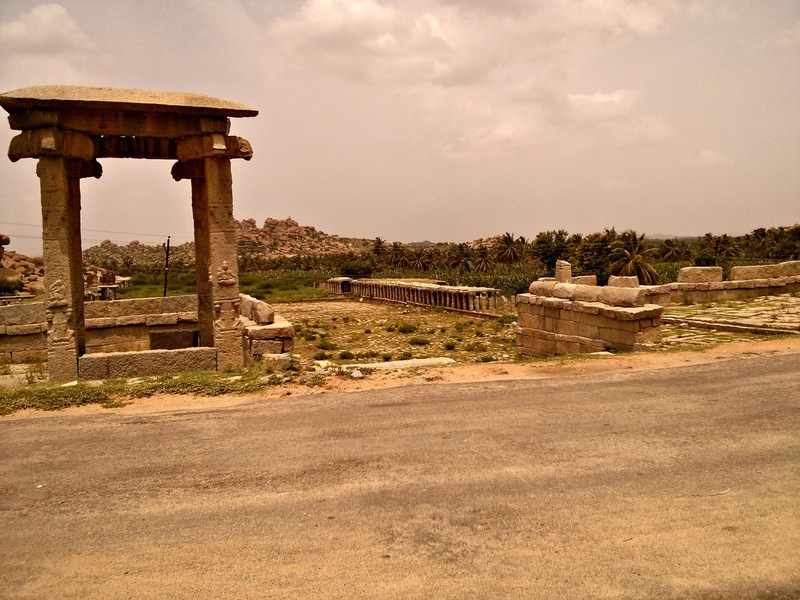 Do I feel we should have spent more time in Hampi? Yes, but I still feel we saw Hampi no matter how small a part. This is a quick guide for a day trip to the lost city. 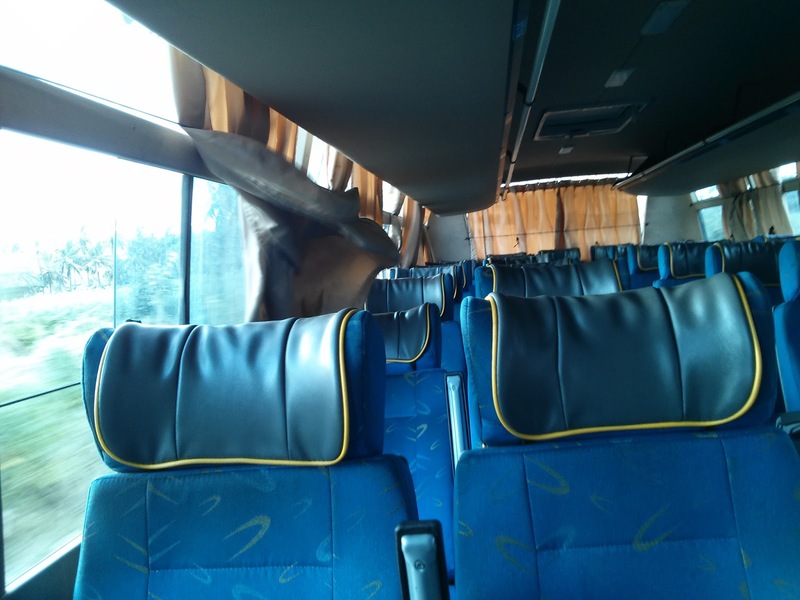 The best way from Hospet to Hampi is by bus. For Rs 40 you will be dropped at Hampi bus stand. Depending on your physical conditions and desire you now have four options. It is actually possible to see the entire city on foot but not in one day unless you are hell bent on it. Do remember it is spread over 25 Km or so. If you want to take this option it is better you crack the deal at Hospet. regular charges were around 300-400 for two people. You can rent a cycle for around 50 a day. 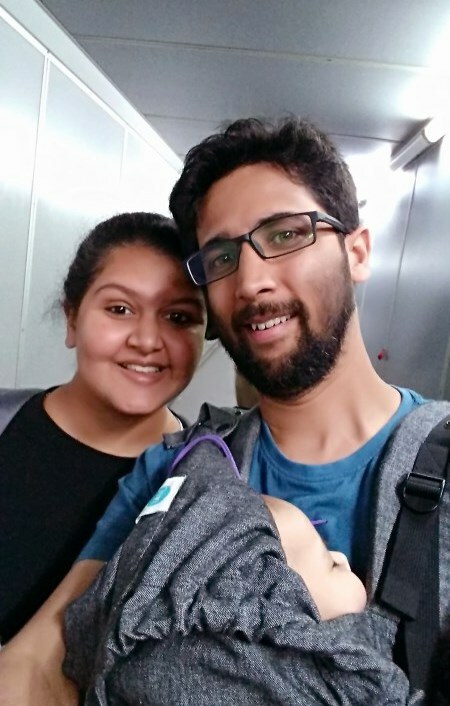 Though it can be tiring as the monuments are connected by hilly roads with a lot of climb. You can rent a bike for 400/- a day with a litre of gas which was definitely enough for us to visit corners of the city. I do think that we got a higher price as we did not haggle. If you want to crack your own deal take the right before the temple as you come in from the bus stand. Nearest gas station is at Kamalpur but you should not need it in case you are there just for a day. This is a limited option though exciting. You can get on a motor boat or a small coracle boats. 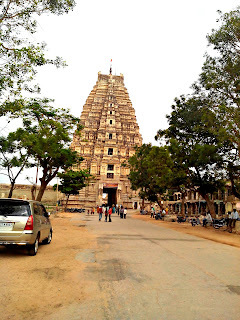 Price for a motor boast ride which takes you to some small temple and drops you to Vittala temple is 150 per person. There are chances you might not need this. Even though we had just a day at Hampi our train left next morning to Goa. If you are taking a train, stay at Hospet. Options are available at 360/- for a double bed room with a clean bathroom. Luxury options are around 2000/- for a double room. 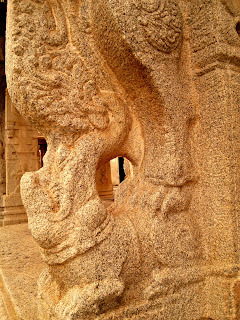 Almost everywhere you see in Hampi there is a glimpse of a mighty empire. As time is limited it is better to limit the sites you visit. It is just next to the bus stand and most often than not this is where most people start their trip. At the other end of the bazaar street. 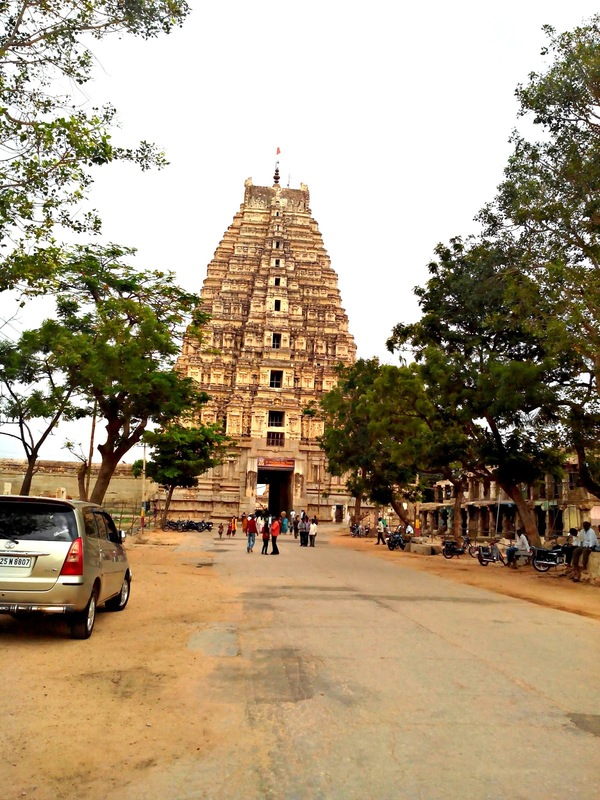 keep driving straight away from Virupaksha temple. There are two statues of ganesha. As you climb up the hill from Hampi to visit the palace complex they will be on your right. A god who was half lion and half human sits proud once you take a small detour on your way to palace complex from Hampi town. There is a board directing you towards the statue. A monolithic shiva linga which almost always has a pool of water surrounding it. It is a pleasure to watch and photograph. Probably the most ornate and lavish of all Hampi temples. It is a long walk to the temple I could not locate a motor-able road. Though the walk in itself is beautiful. I am told there is a bus from Kamalapura to Vittala temple. These will fall on your path when you set out to visit Vittala Temple. Another temple which will fall on your path is Varaha temple. This temple is one of my favorite because of the beautiful market which once bustled opposite to the temple. It truly is a beautiful site when you see buildings carved in stone nestled among lush greenery. A bit outside the main city are these two complex. Keep an eye as it is easy to miss the direction sign. You might want to see the elephant stables and palace pedestals which once had beautiful palaces over them. There are many step-wells scattered all over Hampi but the one in Palace complex beats them all. If you have already visited above sites you must be really tired. This is perhaps the best place to take rest and admire the aqueducts and well of the past. Fascinated by the queens who had an entire complex for themselves? Visit their bath, though it looks plain it used to be quite detailed from inside before people took their pens to the walls. Still it is a beautiful building and worth a visit. Hampi is a small place and as long as you are walking and riding you will be reminded of it all the time. You will find some local namkeen, batter fried chillies, sugar cane juice, lemon soda and coconut water to calm you hunger and replenish water and minerals in your body. Bottled water is easily available everywhere. visit Mango tree do have the buttermilk. If local food is your style come back to Hospet where you will get good local food for quite less. 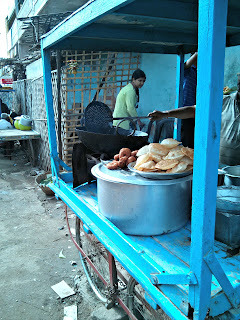 Hospet has a street food area which comes alive in the evening. 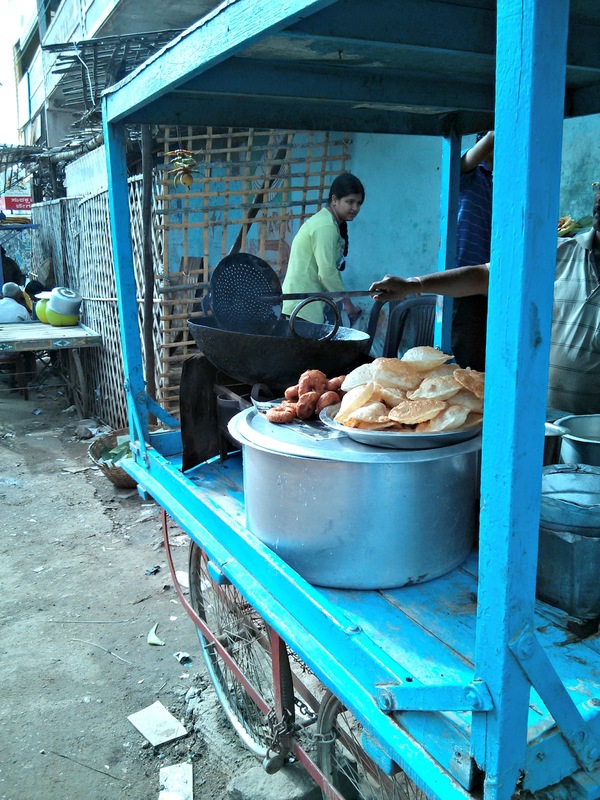 Ask around for Gandhi chowk and you will soon find the small park where local vendors serve delicious street food. Do know your own limits as to what your body can digest. Though there are many temples and all of them beautiful this one is a bit different. Constructed on a slope the temple does not rise above ground. With steps leading down to the temple plinth it is as different as an underground temple experience could be. Take care during rains the temple might see some stagnant water. Faluda at the Hospet street food chowk is really good. and after a long day of travel it is be a welcome treat. Take precautions as you would take anywhere. Dressing conservatively is better especially if you are out for a walk during evening or night time. Pharmacy is easily available in both Hampi town and Hospet. In case you face a puncture, haul your vehicle to the main road and call the guy you booked it from. You will probably not receive any tools along with your bike. For more Pics of this beautiful city visit us here.